Good morning sweet followers! I hope your first week back in "real life" mode wasn't too hard! It's been both good and bad to get back into the swing of thing, it definitely takes some readjustment! 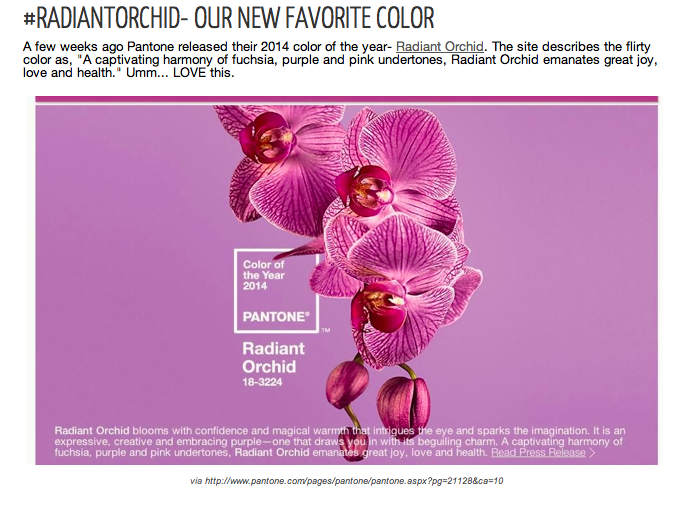 Earlier this week I wrote a post for Modern Magnolias about the Pantone 2014 Color of the Year - Radiant Orchid. When this color first came out I'll admit I was a little disappointed since I was head over heels in love with 2013's color, Emerald. However, this sweet yet sassy purple hue has grown on me and I've come to really like it! I looovvveee radiant orchid! I think it will be such a fun color of the year! :-) Emerald was great too though!